Want to take your pasta dishes up a notch? 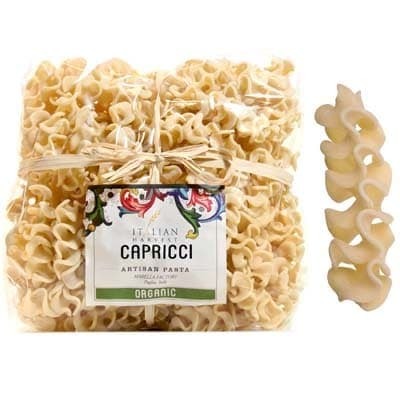 Then try it with these uniquely lovely Organic Capricci pasta by Marella. It was first created as an expression of culinary art by Marella. Since its debut, however, this artisan pasta has become quite a popular choice among chefs all over the world. Quite aptly named, capricci means “whimsy” in Italian. And it looks like dried separated sections of sea corals. The unique shapes are very good for all kinds of pasta sauces, especially thick creamy sauces such as carbonara or ones with meat such as ragù.